It is Heaven’s law and earth’s principle to believe in God and know God, and today—during an age when God incarnate is doing His work in person—is an especially good time to know God. Satisfying God is something that is achieved by building on the foundation of understanding God’s will, and in order to understand God’s will, it is necessary to have some knowledge of God. This knowledge of God is the vision that one who believes in God must have; it is the basis of man’s belief in God. In the absence of this knowledge, man’s belief in God would exist in a vague state, in the midst of empty theory. Even if it is the resolution of people like this to follow God, they will gain nothing. All those who gain nothing in this stream are the ones who will be eliminated—they are all freeloaders. Whichever step of God’s work you experience, you should be accompanied by a mighty vision. Otherwise, it would be difficult for you to accept each step of new work, for the new work of God lies beyond man’s capacity to imagine, and is outside the bounds of his conception. And so, without a shepherd to tend to man, without a shepherd to engage in fellowship about visions, man is incapable of accepting this new work. If man cannot receive visions, then he cannot receive the new work of God, and if man cannot obey God’s new work, then man will be unable to understand God’s will, and so his knowledge of God will amount to nothing. Before man carries out the word of God, he must know the word of God, that is, he must understand God’s will; only in this way can God’s word be carried out accurately and in accordance with God’s will. This is something that everyone who seeks the truth must possess, and it is also the process that everyone who tries to know God must undergo. The process of coming to know the word of God is the process of coming to know God, and also the process of coming to know the work of God. And so, knowing visions not only refers to knowing the humanity of God incarnate, but also includes knowing the word and the work of God. From the word of God people come to understand God’s will, and from the work of God they come to know God’s disposition and what God is. Belief in God is the first step to knowing God. The process of advancing from this initial belief in God to the most profound belief in Him is the process of coming to know God, and the process of experiencing the work of God. If you only believe in God for the sake of believing in God, and not for the sake of coming to know Him, then there is no reality to your faith, and your faith cannot become pure—of this there is no doubt. If, during the process by which he experiences God’s work, man gradually comes to know God, then his disposition will gradually change, and his belief will become increasingly true. In this way, when man achieves success in his belief in God, he will have completely gained God. The reason why God went to such great lengths to become flesh for the second time to do His work in person was so that man would be able to know Him and to see Him. Knowing God[a] is the final effect to be achieved at the conclusion of God’s work; it is the last requirement God makes of mankind. The reason why He does this is for the sake of His final testimony; it is in order that man may finally and completely turn to Him that He does this work. Man can only come to love God by knowing God, and to love God he must know God. No matter how he seeks, or what he seeks to gain, he must be able to achieve knowledge of God. Only in this way can man satisfy God’s heart. Only by knowing God can man have true faith in God, and only by knowing God can he truly revere and obey God. Those who do not know God will never arrive at true obedience and reverence of God. Knowing God includes knowing His disposition, understanding His will, and knowing what He is. Yet whichever aspect one comes to know, each one requires man to pay a price, and requires the will to obey, without which no one would be able to continue following to the end. The work of God is too incompatible with the conceptions of man, God’s disposition and what God is are too difficult for man to know, and everything that God says and does is too incomprehensible to man: If man wishes to follow God and yet is unwilling to obey Him, then man will gain nothing. From the creation of the world until today, God has done much work that is incomprehensible to man and that man has found hard to accept, and God has spoken much that makes the conceptions of man difficult to heal. But He has never ceased His work on account of man’s having too many difficulties; rather, He has carried on working and speaking, and even though great numbers of “warriors” have fallen by the wayside, He is still doing His work, and continues without intermission to choose one group after another of people who are willing to submit to His new work. He has no pity for those fallen “heroes,” and instead treasures those who accept His new work and words. But to what end does He work in this way, step-by-step? Why is He always eliminating some people and choosing others? Why is it that He always employs such a method? The aim of His work is to allow man to know Him, and thus be gained by Him. The principle of His work is to work on those who are able to submit to the work He does today, and not to work on those who submit to the work He has done in the past while opposing the work He does today. Herein lies the reason why He has been eliminating so many people. The effects of the lesson of coming to know God cannot be achieved in one or two days: Man must needs accumulate experiences, undergo suffering, and attain true submission. First of all, start from the work and the words of God. It is imperative that you understand what is included in the knowledge of God, how to achieve this knowledge, and how to see God in your experiences. This is what everyone must do when they have yet to know God. No one can grasp the work and the words of God in one fell swoop, and no one can achieve knowledge of God’s entirety within a short time. There is a necessary process of experience, without which no one would be able to know God or to follow Him sincerely. The more work God does, the more man knows Him. The more at odds the work of God is with man’s conceptions, the more man’s knowledge of Him is renewed and deepened. If the work of God were to remain forever fixed and unchanging, then there wouldn’t be much to man’s knowledge of Him. Between creation and the present, what God did during the Age of Law, what He did during the Age of Grace, and what He does during the Age of Kingdom: you must be crystal clear about these visions. You must know the work of God. Only after following Jesus did Peter gradually come to know about much of the work the Spirit did in Jesus. He said, “Relying on the experiences of man is not enough to achieve complete knowledge; there must be many new things from the work of God to help us to know Him.” At the beginning, Peter believed that Jesus was one sent by God, like an apostle, and he did not see Jesus as the Christ. At this time, when he began to follow Jesus, Jesus asked him, “Simon, son of Jonah, will you follow Me?” Peter said, “I must follow he who is sent by the heavenly Father. I must acknowledge he who is chosen by the Holy Spirit. I will follow You.” From his words, it can be seen that Peter simply had no knowledge of Jesus; he had experienced the words of God, had dealt with himself, and had suffered hardship for God, but he had no knowledge of the work of God. After a period of experience, Peter saw in Jesus many of the deeds of God, he saw the loveliness of God, and he saw much of God’s being in Jesus. So too did he see that the words Jesus spoke could not have been spoken by man, and that the work Jesus did could not have been done by man. In Jesus’ words and actions, furthermore, Peter saw much of the wisdom of God, and much work of a divine nature. During his experiences, he did not merely come to know himself, but also paid close attention to Jesus’ every action, from which he discovered many new things; namely, that there were many expressions of the practical God in the work that God did through Jesus, and that Jesus differed from an ordinary man in the words He spoke and the actions He took, as well as the way in which He shepherded the churches and the work He carried out. And so Peter learned from Jesus many lessons that he was supposed to learn, and by the time Jesus was about to be nailed to the cross, he had gained a certain amount of knowledge of Jesus—knowledge that became the basis of his lifelong loyalty to Jesus and of his crucifixion upside down for the sake of the Lord. Although he was possessed of some conceptions and did not have a clear knowledge of Jesus at the beginning, such things are inevitably a part of corrupt man. As Jesus was about to depart, He told Peter that His crucifixion was the work He had come to do: It was necessary that He be forsaken by the age, and that this impure and old age should nail Him to the cross; He had come to complete the work of redemption, and, having completed this work, His ministry would be at an end. Hearing this, Peter was beset with sorrow, and became even more attached to Jesus. When Jesus was nailed to the cross, Peter wept bitterly in private. Prior to this, he had asked Jesus, “My Lord! You say You are going to be crucified. After You’re gone, when will we see You again?” Was there no element of adulteration in the words that he spoke? Were there no conceptions mixed into them? In his heart, he knew that Jesus had come to complete a part of God’s work, and that after Jesus left, the Spirit would be with him; even though He would be nailed to the cross and ascend to heaven, nevertheless the Spirit of God would be with him. At that time, Peter had some knowledge of Jesus: He knew that Jesus had been sent by the Spirit of God, that the Spirit of God was within Him, and that Jesus was God Himself, that He was Christ. Yet it was because of his love for Jesus, and because of his human weakness, that Peter spoke such words. If, in every step of God’s work, one can observe and painstakingly experience, then one will be able gradually to discover the loveliness of God. And what did Paul take for his vision? When Jesus appeared to him, Paul said, “Who are You, Lord?” Jesus said, “I am Jesus whom you persecute.” This was Paul’s vision. Peter took as his vision Jesus’ resurrection, His appearance for 40 days, and the teachings of Jesus’ lifetime, until the end of his journey. Man experiences God’s work, comes to know himself, purges away his corrupt disposition, and seeks growth in life, all for the sake of knowing God. If you only seek to know yourself and to deal with your own corrupt disposition, but have no knowledge of what work God does upon man, of how great His salvation is, or of how you experience God’s work and witness His deeds, then this experience of yours is fatuous. If you think that one’s life has attained maturity just because one is able to put the truth into practice and to endure, this means that you have still not grasped the true meaning of life or God’s purpose in working man. One day, when you are in the religious churches, among members of the Repentance Church or of the Life Church, you will come across many devout people, whose prayers contain “visions” and who, in their pursuit of life, feel touched and are guided by words. What’s more, they are able in many matters to endure and to forsake themselves, and not to be led by the flesh. At that time, you won’t be able to tell the difference: You will believe that everything they do is right, is the natural expression of life, and what a pity it is that the name that they believe in is wrong. Are not such views foolish? Why is it said that many people have no life? Because they do not know God, and thus it is said that they have no God in their hearts, and have no life. If your belief in God has reached a certain point, where you are capable of thoroughly knowing the deeds of God, the reality of God, and every stage of God’s work, then you are possessed of the truth. If you do not know the work and the disposition of God, then there is still something amiss in your experience. How Jesus carried out that stage of His work, how this stage is being carried out, how God did His work in the Age of Grace and what work was done, what work is being done in this stage—if you do not have a thorough knowledge of these things, then you will never feel assured and you will always be insecure. If, after a period of experience, you are able to know the work done by God and every step of His work, and if you have gained thorough knowledge of God’s aims in speaking His words, and why so many words He has spoken have not been fulfilled, then you may boldly and without holding back pursue the road ahead, free from worry and refinement. You should see by what means God achieves so much of His work. He uses the words He speaks, refining man and transforming his conceptions by means of many different kinds of words. All the suffering that you have endured, all the refinement that you have undergone, the dealing that you have accepted within you, the enlightenment that you have experienced—these have all been achieved by means of the words God has spoken. On what account does man follow God? Because of the words of God! 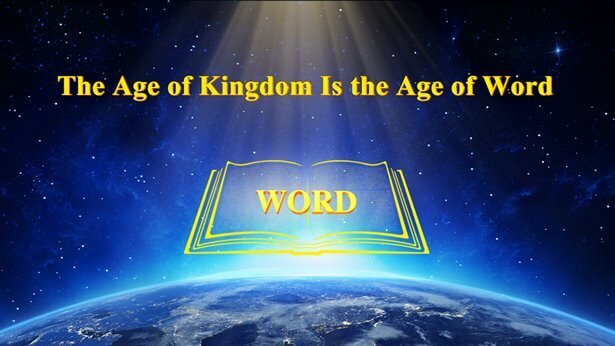 The words of God are deeply mysterious, and they can moreover move man’s heart, reveal things buried deep within it, make him know things that happened in the past, and allow him to penetrate into the future. And so man endures suffering because of God’s words, and is also made perfect because of God’s words: Only at this time does man follow God. What man should do in this stage is accept the words of God, and regardless of whether he is made perfect or subjected to refinement, the words of God are what is key. This is the work of God, and this is also the vision that it behooves man to know today. How does God make man perfect? What is the disposition of God? And what is contained within His disposition? To clarify all of these things: one calls it spreading God’s name, one calls it bearing testimony to God, and one calls it exalting God. Man will, based upon the foundation of knowing God, ultimately become transformed in his life disposition. The more man undergoes being dealt with and being refined, the more he is invigorated; the more numerous the steps of God’s work, the more man is made perfect. Today, in man’s experience, every single step of God’s work strikes back at his conceptions, and all lies beyond man’s intellect and outside his expectations. God provides everything that man needs, and in every respect this is at odds with his conceptions. God utters His words in your time of weakness; only in this way can He supply your life. By striking back at your conceptions, He makes you accept the dealing of God; only in this way can you rid yourself of your corruption. Today, God incarnate works within a state of divinity in one respect, but in another He works in a state of normal humanity. When you cease to be able to deny any work of God, when you are able to submit no matter what God says or does within the state of normal humanity, when you are able to submit and to understand no matter what kind of normality He manifests, and when you have gained actual experience: only then can you be sure that He is God, only then will you stop producing conceptions, and only then will you be able to follow Him to the end. There is wisdom to God’s work. He knows how man can stand fast in testimony to Him, and He knows where man’s vital weakness lies. The words He speaks can strike you at your vital weakness, but He also uses His majestic and wise words to make you stand firm in testimony to Him. Such are the miraculous deeds of God. The work God does is unimaginable to the human intellect. What kinds of corruption that man, being of the flesh, is possessed of, and what constitutes the essence of man, all these are revealed through God’s judgment, which leaves man with nowhere to hide from his shame.